Kady's universe is a lot different from ours. Actually, it is pretty much the same but they know a lot more about it due to the advancements in wormhole jumping, battle spaceships, and artificial intelligence. But Kady does not really care about that right now. All she cares about are the space ships dropping bombs on her planet and the fact that she has to plan an escape with the boy that broke her heart that morning. As it turns out, just escaping is not enough. Kady also has to survive biological attacks in the form of mutating viruses, psychotic artificial intelligence, and a lethal spaceship bent on revenge that is quickly catching up to them. When the livelihood of the entire fleet is endangered, questions of morality, practicality, and probability complicate the already chaotic attempt to retreat. They have the whole universe to run in, but nowhere to run to. 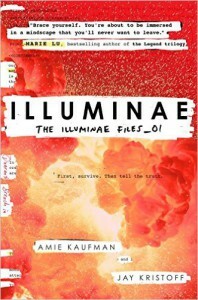 Illuminae is the most unique most that I have read all year. The story is told through different mediums, like instant messages, pictures, surveillance reports, posters, announcements, and anything else you can imagine. I have never read a book quite like it. Since Illuminae is so special, I think that it deserves a review that is equally extraordinary review. So, I am introducing my version of a GIF review. Get ready to go through a whirlwind of emotions and I describe my feelings about this book. This is exactly how I felt when I finally got my hands on this book. I have heard everyone, their mother, their little brother, and their dog squealing about this book. I could not wait to join in on the squealing. The book hits the ground running with the first scene of the book, which details the attack on Kady's planet that starts all of this mess. My heart was hammering and I will admit that my palms were the slightest bit sweaty due to all of the adrenaline that this opening scene caused. This was me during most of the book. Once the adrenaline of the first scene wore off, I realized along with the characters how much trouble they really are in. They are stuck in the middle of space, months away from the slightest chance of safety, playing a lethal game of tag with a battleship that is following them. I do believe my hairs turned gray and I gained a couple of wrinkles after all of the worrying that I did for these characters.On the other hand, this shows that I really loved all of the characters, because they are all awesome. The story is told through countless different perspectives and mediums, which created a diverse, multi-faceted, and endlessly interesting novel. At some times in the book, I was truly disgusted. And yes, somehow it was a good thing. The descriptions and imagery on the ship after everything goes down (sorry, no spoilers) was exquisite, beautiful, and most importantly, disgusting. I truly could envision the horrors that Kady experienced, which is a testament to the story-telling of Kaufman and Kristoff. Among all of the horror, blood, and tragedy, there was a shining star of hope -- the romance. Even though it was not the center focus of the book, it was glorious enough to make the hardest hearts melt (hence the gif of Simon Cowell actually smiling). The romance was neither over-whelming or non-existent, but the prefect balance of there and not there. Kady and Ezra's relationship was a light in the black, soundless vacuum of space. Illuminae did justice to the science part of science fiction. There were no far-flung excuses or shrugged shoulders when it was time to explain what happened. Instead, the nerdy talk came out to perfectly (and mostly logically) explain the science behind what was happening. The nerd inside me was extremely pleased. By the end of the novel, I was so emotionally and mentally drained that all I could do was nod slowly at the fantastic ending. Do not get me wrong, it was far from the standard happily ever after, but I loved it all the same. 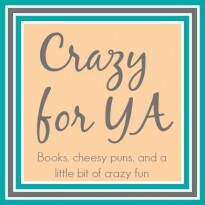 This review and many others are available on my original blog, Crazy for YA.